Acquiring a DLT license. Is it going according to schedule? It’s a long process, but why, please explain. We’re getting ready for the DLT license presentation in Gibraltar. It is indeed a long and difficult process, and the whole core idea of it and why we need a DLT license is that DLT licensing ensures that the company runs a legit business that has a good team behind the project, it has all the necessary tools to protect customers, but apart from that it’s also very important to structure up all internal procedures, policies, and workflows. What this means is that when you are setting up, for example, treasury operations or are dealing with trading operations, it means that you have to have instructions on how people will behave, because when you’re building a company, which will be scaled into an enterprise and a big corporation, later on, you need this set of rules, and this is what the GFSC commission will be looking into. They will be looking into seeing that the business internally is structured in a professional way, that risks are managed and that there is a professional person behind every single department of the company and so forth, this is why we’re taking quite a reasonable amount of time to prepare for DLT. On 6th of May, as you may already know, we’re traveling to Gibraltar, our entire team and I will be representing the Covesting project in front of the commission. As soon as we have additional information on that, we’re definitely going to update you. When the DLT license is granted, which / how many FIAT trading pairs can we expect? It largely depends on the banks that we are going to work with. We have already initiated the process of the bank account setups with several banks. Euro, British Pound, and USD will be definitely there, however, we already initiated the account opening with one bank, which offers quite a lot of currencies. As soon as we have that set up, there will be over 15 fiat currencies available for the transactions. Is commissions calculation based only on P&L in fiat? Yes, at the moment this is the case. We need to pick a benchmark, against which the whole performance will be calculated. At the moment we calculate everything in USD, but again — this is only Beta and at the moment all focus is on the matching engine, liquidity aggregation, on the internal workflows and so on. Once we get closer to developing the whole core of the copy-trading, we’ll start doing that, but there is still a lot of things to discuss and I think about which way will be to bring it better — maybe testing internally and trying different options and as soon as we perform that, there will be more clarity in terms of how the most effective benchmarking would work. Potentially we will even offer something against Bitcoin as well for the performance tracking and also in terms of P&L calculation, but this is something which will be announced a little bit later on. If a trader grows BTC balance but shows “negative” P&L in fiat — taking “profits” (BTC) on that portfolio will be commissions free? At the moment the current logic is yes. Because the benchmark is USD, so it means: there is now performance against USD, it means that there is no profit for the follower, (investor) which means there will be no commission. What process will you put in place to avoid credit card chargebacks? On this matter, I, unfortunately, cannot go into details but from what I know and from what I see is that our treasury and our risk managers and people who are working with the payment processing companies are sending out all the necessary infrastructure to make sure that this will not happen. From here I’m satisfied and of course, we’re going to monitor so these things would not occur. Do you plan to list coins on Covesting exchange ahead of launch or is the plan to rely only on the Liquidity Aggregator on Day-1 (except for COV and USD)? No. We’ve already been approached by a number of ICOs, most of them post-ICOs, looking for a listing on Covesting exchange. We had to rush and prepare all the policies and guidelines necessary for listing these coins. To be honest I don’t think it makes sense to list them on the exchange which is not operating yet. As soon as we go live, as soon as we get the DLT license, as soon as the policy for listing coins is approved by the commission, we will be free to go. We have the list of the contacts for the ICOs that we would be interested to list and I personally think it’s a good marketing move because as soon as you list a coin after the ICO, we’re basically bringing all the community of that coin, however we’ll be seeking for exclusive listings as well. This will give us a considerable advantage, and most of the community members of that ICO will shift to our exchange and build up internal volumes. Could you explain the referral system? We recently released an updated referral program and a medium post about it. The most exciting part is that we’ve increased the payout which can now be up to 40%. It all depends on the volume. Some exchanges prefer to increase the percentage of the commission based on the amount of referred users, however, it’s not a good practice, because it can be easily exploited. We would rather look at the turnover that the referral partner brings in with all of his referral networks and based on that we’re going to motivate him — the more volume on the exchange is built up by this particular partner the more rewards he will be able to get. Could you give a breakdown of the Covesting Asset Contract and the distribution of its value? At least 50% is for buyback and burn program and the rest? Is this to cover platform costs or does the value belong to token holders? Asset Contract is a mechanism for internal monitoring that collects all the commissions from all the activities happening on the platform. It includes risk management workflow, where we have to execute some trades at the end of the day in order to settle the risk towards the fiat, some part of the fund will go towards making burns. Asset contract is like a mechanics which is doing all internal distribution of this commission. At the moment it is 50% that we aim to allocate to buy back and burn, it’s not going to be lower than that. It’s going to be consistent. That said we’re not going to do it once a quarter or once a month, we’re going to be continuous. The more volumes we have and the more commissions we get, the more tokens will be sent to the special locking smart contract, which has lockout period set to infinity, meaning that the tokens will never leave that smart contract. After that, we will continuously update the information about the outstanding supply on Coinmarketcap and all the other trackers. Will there be an insurance fund to buffer against hacks? The question is still on the table. We still have to comply with the rules of GFSC and this is something we’re going to discuss during our trip to Gibraltar. Are u guys going to hire or partner with a global marketing pr once you get the dlt license or are u guys going to have your own marketing team? I.e in-house marketing. No, we have a strong team internally and we’re going to cover every single aspect in terms of the marketing and you should not worry about that. Sometimes we get asked why we don’t do marketing and why we don’t create hype around it. At the current stage, we aim for quality rather than quantity. Understanding that we can do it at any point in time, we prefer to wait until the moment when the public access is available for all the users of the platform. Probably around mid-may we’re going to open the platform to the public, it doesn’t mean that anyone will be able to deposit funds and trade but will be able to explore the platform, use the newly released referral system and start building their own referral marketing, monitor how current beta testers perform, see how the reports are handled together with most of the features of the platform. At that point our marketing campaign will start to kick in — we will go through the social media marketing, PR campaign, we have upcoming series on one of the top televisions in the UK, EasyJet campaign continuing from June, we also have Crypto Intelligence Portal that is gaining momentum — a place where investors & beginners can build up their knowledge and much more. Are there other uses of COV tokens other than Copy Trading and trading pairs? Yes, copy trading is an integral part of the whole infrastructure and it’s really important, however, Covesting Token can be used to decrease the exchange commissions, it also will be used, most probably as a staking for our algorithmic trading. You’ll have to stake a necessary amount of Covesting Tokens in order to access it. There’s a special section on our website explaining how COV tokens can be used. Will Debit cards/Credit cards and Paypal be available for fiat deposits? Yes, debit cards and credit cards will be available for deposits as well as for withdrawals. Do you plan withdrawing in gift cards like Amazon / Steam, etc? We’re not planning to use any gift cards. Will there be a clear differentiation between amateur and professional experienced full-time traders? It’s only a matter of how descriptions will be put in, however, we’re going to put into consideration the risk factors, maximum drawdown, sharp ratios, performance data and further statistics. There won’t be a strict differentiation between an amateur and a professional trader, because any street trader can outperform any professional trader. That said, there is no point in differentiating them, however, everyone is free to describe their own strategy and experience. I believe this is a really important part when an investor is considering who to follow. I’d like to understand Covestings plans with regards to becoming a standalone exchange (not requiring 3rd parties). There was quite an emphasis in the white paper with regards to liquidity aggregation and I’m interested to understand how this has unfolded during development, and whether you’ve met resistance (if you’re perceived as a competition then perhaps some exchanges have not wanted you to integrate with them?). Do you see Covesting becoming a standalone cryptocurrency exchange for people that aren’t interested in the copy trading side of things? Yes, this is the goal and this is what we have been talking for a few months already. By aggregating liquidity from different exchanges, we’re becoming the so-called prime. When you’re building a prime broker means that you’re collecting feed from multiple venues. For example, SaxoBank, where we originally worked with my partners and colleagues was aggregating feeds and trading data and there were connections with 25 exchanges around the world: stock exchanges, futures exchanges also affects liquidity. This is what makes you actually a prime choice for investors. You don’t need to register on several exchanges, you can go to one place which in our case is Covesting and access all of them. Apart from that, aggregating liquidity as a prime, we will also allow trading on the internal exchange. We will offer more commissions. The more users we grow, the more will be executing arbitrage opportunities manually between the aggregated liquidity and the internal liquidity. Our own market-making mechanism will be ensuring that the prices are implying with the current market from the aggregated liquidity, and we are making a cool place to trade. How will Covesting make sure fiat holdings are safe on the platform. For example when people decide to sell huge amounts of crypto for fiat, but don’t cash out immediately to a bank. We don’t hold either fiat or crypto on the platform itself as you think of it. All the crypto funds are held in the cold storage, which is manually processed to the warm wallet, which is further manually processed to the hot wallet. The hot wallet will hold a very small amount of funds in order to execute immediate transactions from our standard amount of incoming and outgoing operations during the day. This is a precaution in order to secure our investors and users’ funds. The same goes with fiat — it will be held in segregated accounts in banks. In every bank, we’ll be opening a clients’ segregated account and a company’s account which will cover the expenses. Both accounts don’t interfere with each other. The clients’ segregated account handles all the transactions — withdrawals and deposits. It’s all a manual process to the Treasury, depending on the amount and the frequency of withdrawals. What measures will you put in place to prevent account holders from using Covesting fiat gateway solely for the purpose of withdrawing cash? Say a miner use Covesting only to liquidate BTC / ETH and withdraw cash? We don’t mind facilitating transactions, withdrawals, deposits and exchanging from crypto to fiat, and the other way round. 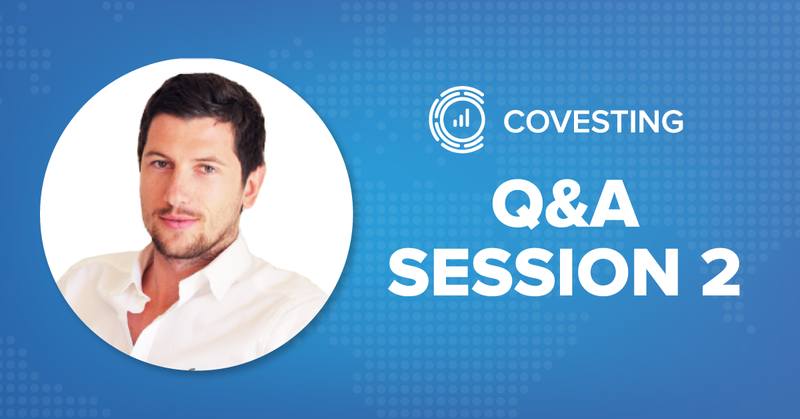 However, there will be a point during the onboarding that the Covesting account primarily should be used for trading. There will be again a transaction monitoring algorithm and in case it spots that one client uses only to deposit funds, convert them and withdraw without any trading activity on the platform, at some time this account might be blocked. Of course allowing to withdraw the funds, but eventually, there might be some questions directed to that specific user asking them if they plan to trade. This is something our compliance team will be looking at and there will be consistent transaction monitoring going on to prevent any money laundering activities and manipulative transactions. This is something again that GFSC of Gibraltar looks on very closely. Are you able to share with us the list (or types) of partnerships you are actively working on, e.g. money transfer services, banks, custodian service, resellers, sales, Marketing etc (Appreciate as complete a list as possible without breaching NDA, if any are in force? No, we will keep that private for now, but we are indeed working on several partnerships. One of them is very significant, which can bring Covesting to a different level, but at the moment I do not want to create expectations. It is going to occur only after we get the licence, as everyone is looking for a legit partner. The thing about exchanges and token listings, it is a very short-term benefit, if we gonna list the token on an external exchange, ti will impact the price in a positive way, but if we delist the token from exchanges and bring the community to trade the token here. Being an exchange, it does not make any sense trading anywhere else. It’s a matter of keeping your community closer to your platform. Especially when we talk about Covesting, which will be an amazing trading platform, I don’t see any reasons for chasing an external exchange. How many people are currently on Covesting monthly payroll? Currently, 28 people, the support staff from around the world is growing quickly, the development team is also growing, we’re now hiring additional people for Android and iOS development. iOS development has already started. How long would the ICO fund sustain Covesting business and development plans with no income coming in? We’re well funded for at least 2–3 years. Did you also raise Private Equity / Venture Capital fund to cover Covesting operations and marketing costs? Regarding US 3rd party payment processor. Would there be a pursue of further licensing for Covesting to independently operate in the US as a financial institution in order to become self-sufficient in handling US fiat integration? Yes. There is a license called Money Transmitter License, which is possible to obtain even online and there’s a quite straightforward procedure for that, but we will pursue such license after obtaining the DLT because the procedures that the Money Transmitter has is more favourable for companies who already licensed in one jurisdiction. Once we’re ready with the DLT license, we will shift to the US to get the Money Transmitter License. Since Covesting has a plan for expansion of offices throughout the globe, would there be additional licenses required? In regard to other exchanges recently moving out from those countries and relocating to Malta. No, because we will operate from the headquarters at World Trade Center in Gibraltar. Any office in other countries is going to be either research and design centers or outsourced remote offices for onboarding teams, we’re looking forward to processing KYC documents very quickly. We will be definitely growing the KYC team. These remote offices don’t require any license, because the core management is happening from Gibraltar. Which languages are currently ready for support for Covesting, and which nations currently have local offices? When are you going to open news offices? Where? Why these markets? Most of European languages, Korean, Chinese, Indian, Portuguese, Russian and more. Over the next weeks, we’ll be translating the website to 12 additional languages as we have a stable version of it now. The platform will also be translated in the future. Instead of just Covesting indexes of top coins, is there a possibility of having indexes of top traders for people to copy? No, at the moment we did not consider that. You build up your own portfolio of traders because you’ll be able to follow up to 20 of them. We’re just going to introduce the indexes of Covesting 25, Covesting 50 and Covesting 100 to cover the exposure. There will be probably a Covesting short index in order to get the short exposure in case someone wants to bet on the falling market. If a trader has a very large amount of people copying him and then suddenly changes his profile to private, would this sudden rush of people having their portfolios converted to COV (ie purchasing them on the exchange) cause a massive and unsustainable pump in COV price? A trader may decide to take profits and reduce his fund size. Are followers able to do the same by taking partial profits — reducing his corresponding fund size by the same percentage as the trader? NOT merely rebalancing his portfolio split but actually copy the same strategy as a trader to take money off the table. The current copy trading is very simplified. It’s built in order to test out how the performance tracking features work, to calculate the performance correctly and based on that we’re bringing you risk data calculations, somethings like sharp ratios. The moment we introduce the copy trading itself, it’s going be different from the one you see at the moment — including some necessary protection measures in order to avoid situations, such as in the given question. The trader won’t be able to completely stop his following immediately. There will be a procedure, which will require a trader to initially make an announcement about that. The platform will automatically send out the system messages and emails to all of the followers about the upcoming termination of the model. Followers will be well aware beforehand — at least 5 days before the model gets terminated. At the moment we’re figuring out the most efficient ways to handle user cases. We have 50 to 60 different user cases of what potentially might happen. Everything is taken into account, and some serious tests will be done before the release to the public. Please share more about Algo Trading features on the platform. Will this be included on Day-1? How do investors take part or make use of the algorithms? Algo Trading will not be available on Day 1, it might be released closer to Q4. It’s not on the same level as of how current cross-exchange arbitrage systems operate. It’s going to be close to Artificial Intelligence machine learning and it’s a quite heavy task. It includes all of the exchanges where cross arbitrage can be executed. We will probably implement COV token staking during the algorithmic trading. If you want to utilize the functionality of the algorithmic trading, you have to stake a particular amount of COV tokens, which is not yet decided. Do you have a policy to support or otherwise, hard forks of deposited coins and tokens on Covesting exchange? Taking snapshots and redistributing requires a dedicated blockchain team, a clear policy from the outset is highly recommended. From day 1 — No, however, we have that in the pipeline and we aim to build that up as well. What are the qualifications required by Covesting to become a trader? Anyone can become a Covesting trader. Can users develop and market algo scripts to earn COV? At a later stage — yes. Once we are ready to offer the open API from our side, the ones who have their algorithmic strategies developed and ready will be able to connect to the Covesting platform. Any progress of development for mobile application(Android, iOS)? Have development started yet? Is this still expected to be released according to the roadmap? When will this be available for testing? We have some progress, and I’m finally happy with the iOS design. We’ve checked the existing things on the market and we weren’t impressed by them, so we came up with our own solution. The iOS app is going to look amazing, it has new features that are not present on the current products available on the market. The team is working really hard to get that done in Q2 as it was originally planned. Is there a minimum amount of COV needed to copy trade? This is still under discussion, but it will be roughly $100 worth of COV tokens required. A final number will be released once we start operation. Will we be able to transfer from the exchange back to our bank accounts or credit cards? Also, who is the blonde guy? Definitely yes. That is the reason why we’re working on the DLT license and building strong relationship with our banks in Europe. We look forward to being a good, transparent and authorized fiat gate for all the cryptocurrencies, traders and our users. Do you plan on attending any major upcoming blockchain conferences? If so, do you plan to have booths, sit on panels, speaker engagement etc? Although I know that the team is picky in selecting right events, there are a lot of different events frequently and COV should be up there as well to reach the right people and get promising partnerships. We evaluated the opportunity to participate in the Consensus, but at the moment we’re so overwhelmed with the development. We realize that if you go to such an event to bring exposure, you want to be one of the major sponsors of it. We don’t want to be one of the thousands of small booths, we want to sponsor the event, make an after-party and we want to have a solid product by then. There is a difference between going there and talking about an idea and a real working product. Will you consider allowing a larger number of traders, say, ICO participants, to do real trades after May 1 with crypto deposits and withdrawals whilst waiting for Q3? We’re trying to be as legally compliant as possible. This is something that our major potential partners request and this what GFSC wants. We don’t want to spoil that as we’re getting really close to obtaining a license, therefore we don’t want to get to situations where the commission of Gibraltar questions our professional approach. We’re not going to allow anyone to risk their funds, because we didn’t go through the massive penetration tests yet. We have white hat hackers testing the platform for multiple vulnerabilities and companies that we partnered with that will start checking the platform a little bit later on, once a stable release with all the features will be there. Internal encrypted messages. This is the way you can interact within the Covesting ecosystem. We’re building an infrastructure where institutional investors will be comfortable operating in. Most of these institutional investors are not only satisfied with performance results — they need to ask questions, understand risks behind a strategy and much more. We need to ensure that there is an encrypted way of communication between users. Apart from that, there’s a report section, which will also be rolled out in May, giving you the ability to extract absolutely complete information about the performance, all of your paid commissions, all of the generated success fees, referral fees, everything you need to do your tax report or just an analysis of your trading. The report function will be another breakthrough — nonexistent on the current exchanges. Do you have to completely unfollow a trader to take some profits? Or can you reduce your investment by an exact amount or percentage of what is allocated to that specific trader? No, you can partially reduce the portfolio of the investor into one trader or another. What will the limits be for USD wire transfers on a daily or monthly basis for both deposits and withdrawals? Will wire transfer deposits into the exchange be available for same day use? Or will there be a holding period? What will the purchase/withdrawal limits be within the exchange from fiat to crypto on a daily/monthly basis for deposits and withdrawals? That will depend on the verification level and the country where the user is coming from. There will be a KYC for every client. However, the source of funds will be required for the ones who are looking to withdraw a slightly larger amount — an additional documentation that will be required by our onboard and KYC team. Can you confirm that Covesting will be arranging their own KYC and not having it outsourced to an external company ?, I have very negative info about one company if this was not going to be done in-house. We are thinking that outsourcing KYC team is a risky practice. We dislike the thought of sending documents to third parties and not knowing what they are doing with it. We’re developing a very advanced KYC and onboarding procedure, which will allow us to effectively onboard a lot of new clients per minute. All documents will be encrypted and held in house, there will be an automatic system reminding every user to update their information — when the passport is expiring for example. Please list down the “must have” checklist that needs to be in place before Covesting opens to the public. First of all is the DLT, second is payment processors and banks, third is security tests and at the end, we have to do all the beta tests, to make sure everyone is satisfied. Do you plan to phase (limit number of new accounts) gradually or open the floodgate for All to sign-up at launch? We will be able to allow everyone to register, log in and explore. It doesn’t make sense to limit users from having access to it, however not everyone will be able to trade at the very beginning and we will be letting in new users to trade in batches, doing verification processes for them and confirming documents. I have a slightly more technical and longer question to ask which has been kind of asked in different ways with previous comments. Currently, the circulating supply is COV is sitting at 17,500,000 which as we all should know is a good number and very low compared to many projects. It’s to my understanding that we will have to use COV to enter into copy trading and algo trading on the platform. Let’s use the following example to explain the question. - I enter into a copy trading agreement with Lavrov for $10,000, so I’ve put up 2000 COV to do this. - I plan to stay in this agreement and copy his trades for 3 months. What happens to the COV tokens that I have used to copy Lavrov’s trades? Are they held in escrow until the copy trading agreement has finalized and I’m taking profits? Or are they immediately sold into the market once the agreement has started? The reason I ask is because, to me, I think the answer is the latter. If that is the case I struggle to see how the price of COV can accrue serious value if it’s continuously available for purchase on the open market, albeit on the COV internal exchange I would imagine. Also, once the copy trading agreement comes to an end, would I be correct in saying we are paid out in COV also? I’m extremely bullish on the project but struggle slightly to understand how the token supply is going to be limited and increase demand for HODLers. I understand you will be burning 50% of your commission fees for the platform but I was hoping that the COV tokens would be held in escrow for the duration of copy/algo trading to limit the supply on the open market and increase demand amongst those getting involved. Love the work you guys are doing and can’t wait to hear your thoughts on this. We see it as a very positive thing because as I mentioned in the previous Q&A, we don’t use Covesting token just for copy trading — it has many additional features such as lowering fees, algo trading. The interesting part is that when you start following a trader you COV token indeed is sold against the basked of the currencies, but on the other side, you have the investors unfollowing the traders and immediately selling the basket of tokens for COV. This will create a really healthy liquidity and volume for the token itself. When the platform grows, within the first months we’ll be able to see that COV token is really volatile and liquid, however, the delta of buyback and burns will remain within the locked smart contract. Can you please explain the concept of internal liquidity pool of COV tokens to help reduce any selling pressure during copy trading, while promoting market buys for people who wishes to utilize copy trading. We have an internal pool where in order for an investor to follow a trader, he will have to buy the COV token, apart from that, we as a company will be also buying on the market a particular amount of Covesting Tokens in order to facilitate the market making during the first days, afterwards of course from the generated profits/commissions the amount of Covesting tokens will be building up with us internally and then — in line with our risk management strategy to keep a significant amount of tokens internally in order to continuously supply the demand and also to market make it — making the book liquid. Will the partnership with Easyjet continue in June? Right at the start of the holiday season (and possibly in a Bullrun) would be a good time to reach a lot of people eager to invest in cryptos. Will there be a limit on followers for a particular trader? If so, how is it determined? At the moment no, as we don’t see any risks. We might implement some automatic surveillance and automatic monitoring in order to limit any potential market manipulations and frauds. We plan to do it really gradually and cope with all the potential risk factors which may arise during the copy trading and trading itself. Which nationals are currently not allowed by Covesting for copy trading after the platform launch? The countries which are in the sanction list provided by the Thomson Reuters. This is something we have to comply with our AML directory — unfortunately, we cannot onboard these countries. How many traders will be able to access copy beta, and when does it start? We are thinking of making a trading competition once we’re finished with our features and the beta testers have no more bugs to report nor ideas to offer — this is a moment when we will continue again to make an exciting journey for our community on the platform itself. Expect beta testing for copy trading around the beginning of Q3. What ideas are you considering to deal with “dust” in trader’s portfolio? What incentive is there for a new person to want to use a referral code as opposed to signing up directly with the platform? We think about the incentive for a new person to sign up for the referral link and this is going to be probably a fixed amount of funds used only for the fees. These funds won’t be withdrawable, nor tradable. Do you plan to add margin trading capabilities that include long, short positions, and leverage? Yes, definitely — first we need to go through physical based class trading, what is happening at the moment and once we’re satisfied with that, we will be able to scale further. In regards to the traders, the majority are active users in the community. Some are very good traders, others are just fans and testing for bugs. At which point will you be inviting a large number of professional traders to the platform? It goes in line with our vision about when we’re going to massively participate in the road shows, conferences and so on. There is no point in bringing a professional guy, earning a significant amount of money to a platform that is not finished yet. We’re showcasing the idea to traders and the feedback is great. A lot of traders from the trading view are in touch with us, a lot of traders who shifted from forex over cryptocurrencies with tons of experience will be on the platform. Will the development team and management consider using Lightning Technology if Ethereum moves in that direction? We like innovations, however decentralized exchanges, on chain transactions, order matching based on the blockchain are not bulletproof yet. It has to be developed, has to be tested and has to be proven as a more efficient way than centralized exchanges. To this day we still see bugs occurring in smart contracts and there might be more vulnerabilities that are yet to be discovered, until the day we find it as a good solution and it’s proven to be safe for the clients — we will definitely move there as well. Please click here to access the full Q&A video.